The door burst open, and Sophia sailed in with my morning cappuccino. She was humming under her breath and had that telltale postsex glow about her. I tried not to hate her too much. I took a restorative sip of cappuccino. “Ahh. Well, I hope you didn’t tire her out too much last night. Or vice versa.” I winked at her, even though I didn’t feel very winky. “Right.” I put down my cup, having lost my taste for the cappuccino. “No. I begged him to tell me why, and all he would say is ‘I’m not good for you. I don’t want to hurt you anymore.’ I guess the safety thing is the most plausible explanation. Because other than that, it’s bizarre that he would walk away and throw away a great thing. We were….” I paused, hit by an unexpected wave of grief. “Damn it, Soph, we were really good together. Yes, we were young, but we complemented each other so well. Like, I brought him out of his shell, and he calmed me down. And he took me seriously. He listened to me in a way no one but Jonny ever had before.” My eyes betrayed me by welling up. Sophia’s words threw little daggers at my silly heart. Jonathan had said essentially the same thing. If they both thought Walter still cared for me, maybe it was true. And God, if it was true, I was in deep waters. I knew I should stiffen my backbone and armor myself with outrage. But I couldn’t. Still hung up on Walter Elkins? Guilty as charged. Convicted. Lock me up and throw away the key, because I had no hope of rehabilitation. I put my face in my hands for a moment. What a hopeless sentimental fool! 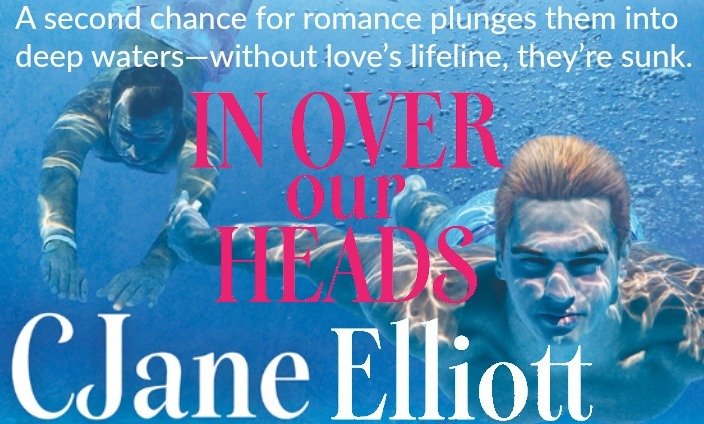 Celebrate the release of In Over Our Heads with a special sale: All the Way to Shore is on sale for 99 cents at Amazon through October 24 with that price matched at the Dreamspinner Press store October 16-24. CJane is an ardent supporter of LGBTQ equality and is particularly fond of coming out stories. In her spare time, CJane can be found dancing, listening to music, or watching old movies. Her husband and son support her writing habit by staying out of the way when they see her hunched over, staring intensely at her laptop.